Hello Girls! Only a few sleeps left until the big day! I hope you've all finished your Christmas shopping and have found a rational way to buy presents for others instead of picking up gifts for yourself. Who am I kidding?! I know I'm not the only one to have taken advantage of the Boots mix and match 3 for 2 offer and picked up a little something for themselves. Well I'd hope I'm not, I may be wrong. I've had a hefty task of buying presents for loads of people this year, luckily most of them being real girly girls who love a bit of pampering which has made gift buying stress free for me for the first time in years. I picked up gifts and if you read my Christmas Wishlist post (read it here) then you'll know I am hoping to get the 'Best Of All' gift set for Christmas, of course if I do I'll share my thoughts! Individually the gift box costs £10.00 from Boots which I think is such great value for 5 products inside. They may not be full size but they certainly add a little bit of luxury to bathtime. I picked mine up for free which is an even better reason to have fallen in love with it. The only bad thing about it is that it doesn't feature newer products like the Sugar Crush products or make-up, but instead boats more 'classic' products like The Righteous Butter. In my opinion this hand cream is an absolute godsend. It's thick, creamy and an absolute dream to apply. The handy mini size means it's an essential to carry around in your handbag, especially at this time of year when your hands are dry beyond relief. Body butters don't come mch better than this one! I've tried brand after brand and have always without fail come back to this one. It's scented with that infamous Soap & Glory fragrance and sinks into the skin so easily, leaving it soft and smooth beyond belief. 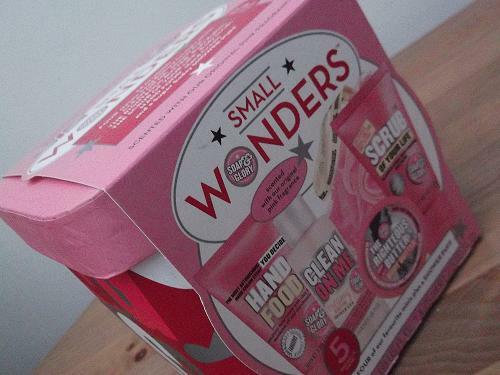 This is another classic Soap & Glory product, and I think I've gone through two or three full sized bottles of this in the past. It's got such a strong scent to it and whenever I catch a smell of my skin it's still there. It's so creamy and moisturising so it's perfect for this time of year. There's not a better feeling than a fresh new fluffy loofah! And not the individual tiny ones you find hanging up in the shower section of shops. This one is so fluffy it's ridiculous, it's so soft and you can feel it exfoliating each time you use a shower gel with it. Yet another firm favourite of mine. This is one of my holy grail body exfoliators along with the St Tropez Body Polish. Once again it carries the signature floral fragrance from all the Soap and Glory products and it leaves your skin feeling absolutely incredible. I always use this on my knees, ankles and elbows before tanning and it creates an amazing base to apply my trusty St Moriz to. 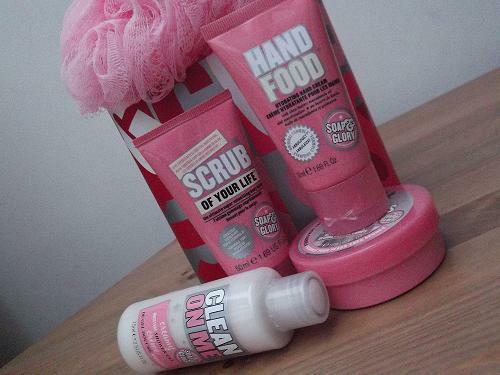 Have you picked up any great products from Soap and Glory lately? 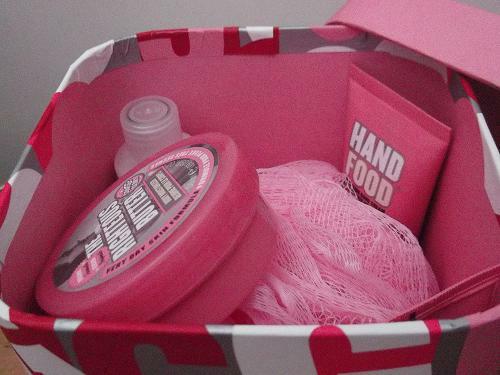 I love their 'hand food' & their 'scrub of your life' are definitely my favourites! I'm a soap & glory fiend! Love this so mad I didn't get my hands on this set!